power at the Beech Grove, Ind. shops. To back up his assertion, Boyd pointed to a handful of positive indicators: on time performance was up 20 percent over the previous fiscal year, equipment reliability—thanks to the delivery of new locomotives and rolling stock—was at one of its lowest out-of-service ratios ever and operating revenues were up 14 percent over the previous year. Following the 1979 route-restructuring, Amtrak operated a system with approximately 24,000 route miles and 525 stations. 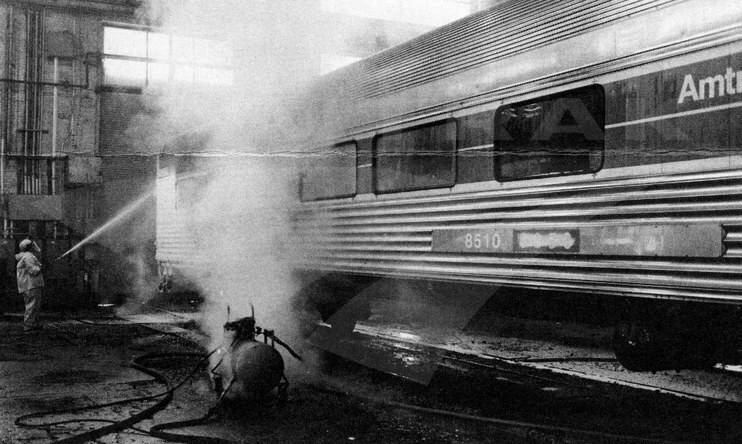 The introduction of modern equipment was especially important in improving the public’s view of Amtrak. After 1975, ridership gains were attributed to routes with new, stainless steel Amfleet cars; during 1980, bi-level Superliner equipment replaced older cars on the San Francisco Zephyr (Chicago-San Francisco), Southwest Limited (Chicago-Los Angeles) and Desert Wind (Ogden-Los Angeles). In the east, remanufactured all-electric cars were introduced on routes such as the Crescent (New York-New Orleans) and Lake Shore Limited (New York/Boston-Chicago). Many of these older Coaches, Sleeping cars and Diners had been converted from steam power to electric head-end power. A converted 12-car set saved the company approximately $250,000 a year in fuel, maintenance and yard support costs. Within a year, all Amtrak rolling stock purchased from the predecessor railroads would be converted to head-end power. Building on the success of the Amfleet equipment, Amtrak ordered an additional 150 cars of this design. While the exterior shells were similar, the new cars had one vestibule, larger windows and interiors outfitted for long-distance service. Manufactured by the Budd Company of Red Lion, Pa., the $150 million order included 125 Coaches and 25 food service cars that became known as Amfleet II equipment. 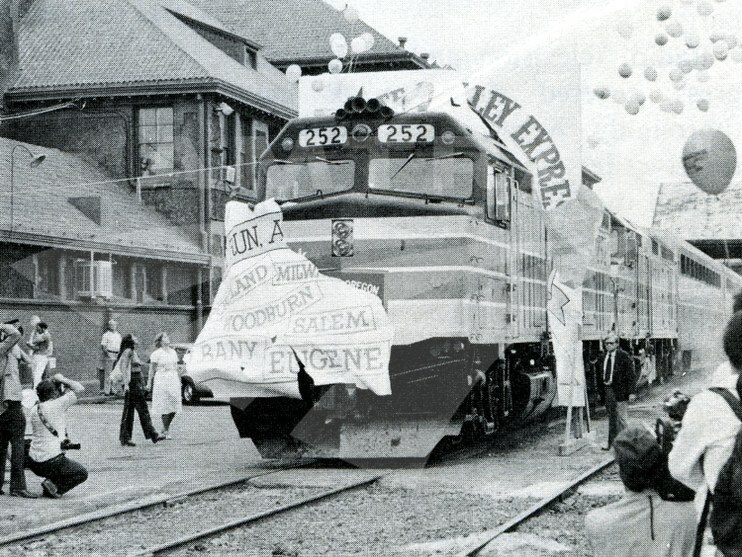 Production also continued on the AEM-7 electric locomotives, whose delivery finally allowed for the retirement of the revered GG-1s operating in the Northeast. Demand for passenger rail service resulted in the creation of five new state-supported routes in California, Illinois, Missouri, Oregon and Pennsylvania, for a total of 15 state-supported routes across the nation. Changes to the Rail Passenger Service Act of 1970 made it easier for states to fund services and test the market. The new legislation required states to only fund 20 percent of the operating losses during the first year, with that amount increasing to 50 percent in the second year. Portland during its inaugural run on August 2, 1980. A milestone in transportation planning occurred in October 1980 with the opening of a new $3 million rail station along the Northeast Corridor (NEC) at Baltimore-Washington International Airport. Considered the nation's "first intercity air-rail-ground transportation" facility, it allowed for easy transfers between various transportation modes while also offering ample parking. Amtrak also renegotiated interline agreements with bus carriers such as Greyhound and Trailways. Due to these cooperative efforts, passengers could purchase train-bus through tickets in one easy transaction at numerous Amtrak or bus ticket outlets. Overall, interline agreements with bus, steamship and airline companies gave Amtrak access to 87 markets not directly served by passenger rail. A major rebuilding project came to fruition at the Beech Grove, Ind. maintenance shops. 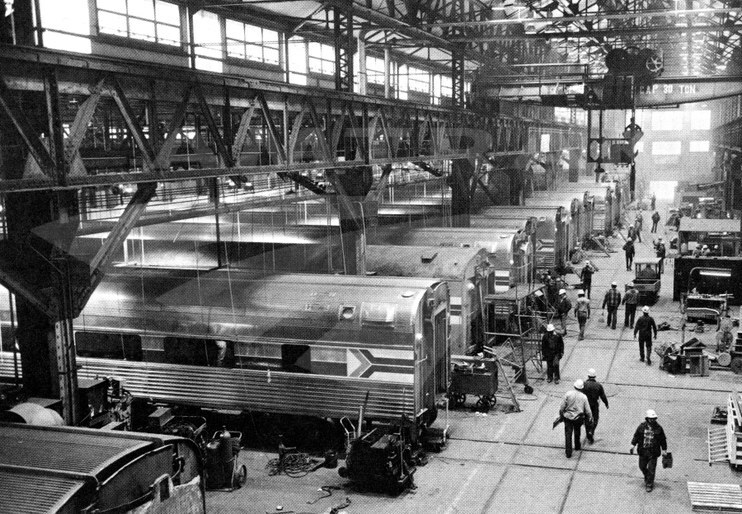 After purchasing the facility from Penn Central in 1975, Amtrak undertook a five year, $22 million upgrade program that advanced the overall efficiency of the shops, reduced energy consumption and allowed for equipment overhauls to be performed in-house. Work also continued on the $2.5 billion Northeast Corridor Improvement Project (NECIP) launched in 1977. In 1980, crews installed more than 236,000 concrete cross ties with the automated track laying system (TLS); laid 37 track miles of continuous welded rail; cleaned 129 track miles of ballast; and replaced or rehabilitated 120 switches. In the North River tunnels connecting New Jersey with Manhattan, built in the early 20th century, approximately 700 pre-fabricated track panels and more than five track miles of continuous welded rail were installed. Up in the air, Amtrak crews replaced 58 miles of catenary wire. Although the NECIP would produce a modern railroad in one of the nation’s most populous and congested regions, lengthened schedules and delays due to frequent work periods caused passenger miles to drop by 4.3 percent. Fortunately, by year’s end, slow orders affecting track on the NEC were reduced from 98 miles to 30 miles. The completion of track work to permit top speeds of 110 mph in more areas also meant that “the average speed (including stops) of Metroliners was raised from 58.7 mph in April to 62.0 mph in October.” Delivery of faster AEM-7 locomotives also permitted significant schedule reductions on some trains. To better organize scheduling for all trains—intercity, commuter and freight—on the NEC, Amtrak established a new Train Planning and Scheduling Unit “to coordinate the operation of the 1,335 trains of all types which use the Corridor each weekday.” Advances in computer modeling contributed greatly to this effort. The NECIP prompted Amtrak real estate experts to take a fresh look at the development opportunities for stations and adjoining properties. In the Annual Report, the company noted: “In 10 separate [NEC] locations, [Amtrak] is working with local governments and private industry to develop these properties commercially…Amtrak will continue to get full financial benefit as the properties become more valuable. At the same time, the improvement will result in more convenience for rail riders and a better physical environment to attract additional patronage.” In Philadelphia, Amtrak investigated redevelopment of 30 acres of air rights north of 30th Street Station. National Railroad Passenger Corporation, Annual Reports for fiscal years 1979-1980.